Oct 16, 2016- What a great day for Sappio! 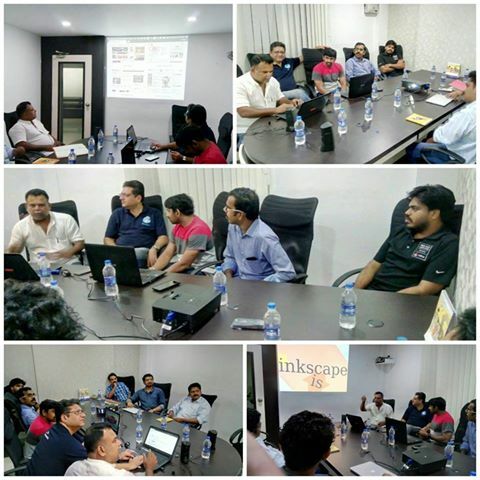 It was the FOSS (Free and Open Source Software) Club Kerala meet-up which proved to be an exemplary event with many Linux Evangelists getting together at one place. They expressed thoughts and ideas to help people spread free and open source software in their local networks and brought to notice of all the latest and trending news, upcoming conferences and more. Thanks to Mr. Mathew Chacko who presented an excellent session about Introduction to Drupal – a free and open-source content management framework written in PHP and distributed under the GNU General Public License. Mr. Thomas Vazhapilly accelerated things with a slide presentation using Inkscape. Furthermore individual interests, experience, expertise were all discussed between the attendees. New professional relationships took a trigger and we at Sappio are extremely happy to have hosted this Event. We thank Joseph john , Ananthanarayanan, Sreenath, Naveen, Shabeer, Rajagopal, Celsius, Thomas and Kabeer. especially for finding time of your busy schedules and join us here. We are hoping to be able to host similar and even more innovative events in the future lined up for all of us.